The keys to discovery are right below your feet. The soil is teeming with microscopic life including many types of fungi. While most soil fungi are impossible to see with the naked eye, they are adept at producing new drug-like compounds called natural products. These remarkable molecules hold promise for impeding the growth of cancer cells, stopping the spread of infectious pathogens, as well as treating many other human diseases. The Citizen Science Soil Collection program is an initiative designed to bring together biomedical researchers with citizen scientists in an effort to find new soil fungi that produce natural products from across the United States. Participation is simple; we are asking citizen scientists to send a scoop of soil from their own backyards. With dozens of fungi occupying a single handful of soil, this simple act helps our group explore the vast uncharted potential of fungi and their natural products to fight against many types of diseases. Citizen scientists are already participating from across the country, including school groups, home-school groups, scout troops, families, and individuals. By providing hands-on experience in learning about the value of soil and microbes, this project supports educational curriculum for school-aged children and gets the public involved in science! Anyone can be a citizen scientist and help to further our potential life-saving research. What's in your backyard? 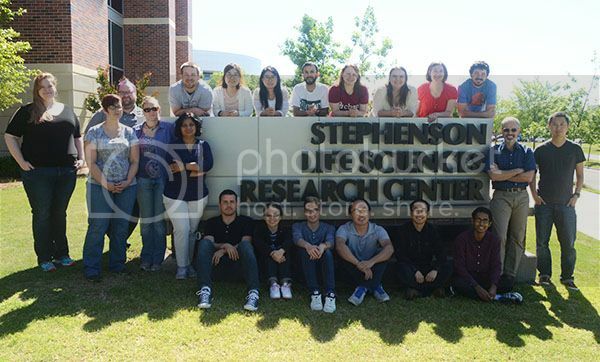 Teaming up with the University of Oklahoma Library, the Natural Products Discovery Group is making data from this program accessible in an open access archive. Citizen scientists can now easily follow their samples online, discover how many fungi came from their sample, as well as view pictures of these amazing organisms! Click here to learn more about the Citizen Science Soil Collection Program. The Natural Products Discovery Group (NPDG) at the University of Oklahoma is composed of a team of scientists including principal investigator, Dr. Robert Cichewicz, research scientists, post-doctoral fellows, and students, dedicated to finding creative solutions that transform the chemistry of nature into products that improve lives. We need your help to keep this program alive. This potentially life-saving research cannot continue without new samples from citizen scientists. You can help us provide collection kits to schools, troops, families, and community groups! Your generous donation will help us keep the collection kits going out across the nation by directly supporting the cost of materials and shipping. Your support will help ensure that we can continue this worthwhile public research initiative. You can make a difference by actively supporting research focused on creating lifesaving medicines for use in the fight against pediatric cancers, breast cancers, fungal infections, and other debilitating diseases. What is your citizen science story? 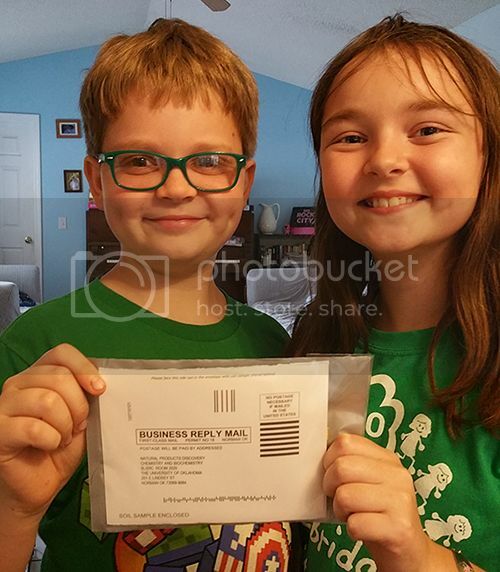 Quinn (12) and Ainsley (11) from Lakeland, FL participated in the Citizen Science Soil Collection Program as part of their home school science lesson. The Citizen Science Soil Collection provides the distinct opportunity for the public to get involved in this important and exciting research. Please encourage your friends, family, and colleagues to join us in the discovery process! Learn more at www.npdgcitizenscience.org. Provide support for two collection kits. Support collection kits for a small family or group. Support collection kits for a scout troop. Support collection kits for one school class. Support collection kits for a summer reading program. Support collection kits for an entire school!